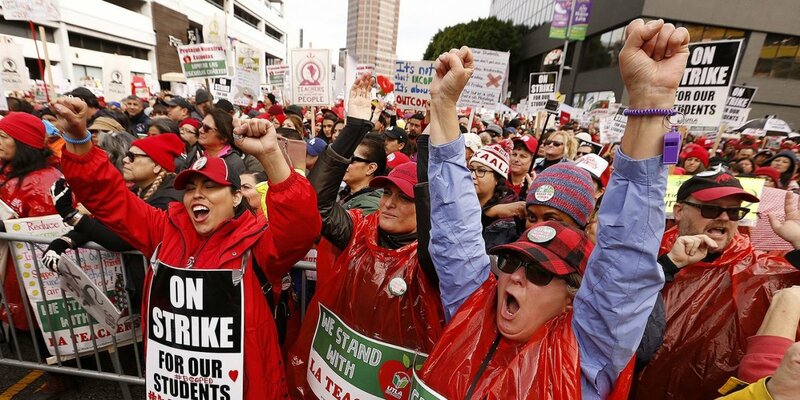 "The agreement is a paradigm shift for the city and nation, as it makes a clear commitment to the resources and conditions necessary for teachers to teach and kids to learn in L.A.'s public schools," AFT President Randi Weingarten says. "This strike and the community support of the teacher strikers flipped the debate over public education in L.A. on its head. And the result is nothing short of a sea change for public schools and for educators in L.A. and in the country." The strike proved to the district that the public stands behind public school teachers. Parents, students, clergy, the entire union community and the Los Angeles educators came together to inspire city leadership to reorder their priorities and put public schools first. In ways large and small, people stood with students and teachers: There was the police officer who lent his RV to be used a rest station on the picket lines; the parents who staged an impromptu press conference to ensure their calls to support the teachers would be heard; the teachers packing thousands of bags of food for their students so they wouldn't go hungry during the strike; and the tens of thousands of people from all over the country who signed petitions, spoke out on social media and called the school district offices on behalf of this cause.